This month, I’m featuring comments by a dear friend, colleague, and badass bass trombonist: Chris Davis. Chris and I met in graduate school at Northwestern, and we became fast friends. We would spend afternoons playing Adam routines on the music school lawn overlooking Lake Michigan, stay up late in the recital hall playing drones, duets, and excerpts, and play mock auditions for each other. Of course, we’d hang out and drink beer, too. What immediately impressed me about Chris was his work ethic. I’ve met few people, if any, who have the work ethic that Chris exhibits. At one point, I remember Chris working the door at a local bar from 9pm-3am, going home to sleep for a couple hours, waking up to work the stocking shift at Menard’s (like Home Depot), then STILL being the first guy in the practice rooms the next morning!! Playing-wise, Chris’s sensitivity on the bass trombone, warmth of sound, and ability to play EXTREMELY soft was a constant inspiration, especially in our trombone quartet. OK, enough praise to Chris — I’m sure he is turning red while reading this. This month’s topic deals with how we define success as musicians. In school — or at least my school — there was so much emphasis on winning a major orchestra job that it was easy to lose sight of other possibilities in the music field. This emphasis mostly came from peers, not from the faculty. 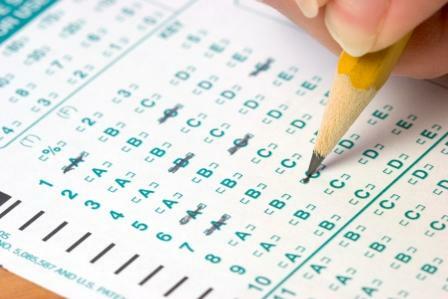 I remember one particular conversation with a freshman trumpet player where he said “WHEN I win by big job” and not “IF I win my big job.” (He’s now in the New York Philharmonic, by the way) Of course, this kind of confidence is necessary to succeed in winning an audition, but this culture is also a double-edged sword. What happens if you don’t win a big job, or discover that there are other things that fulfill you just as much or even more? The reason I asked Chris to contribute this month is that he has wrestled with this concept and has found complete happiness in a diversified career. He has performed with some of the country’s top orchestras, including Chicago, Minnesota, Pittsburgh, Detroit, Chicago Lyric Opera and the St. Paul Chamber Orchestra, been a New World Symphony fellow and a Pittsburgh Symphony African-American fellow, secured teaching positions at Northwestern University and Wheaton College, is a wonderful father, and also referees basketball. Most of these opportunities were secured not by an audition on one given day, but from a career of auditioning everyday in the way he approaches playing, musical citizenship, and interpersonal relationships. In my mind, this makes one MORE successful than winning an audition, because freelancing really is a matter of proving yourself every day. Thank you, Chris, for your insights and taking the time to share them with us! I wish I had this wisdom while still in school. At one point in my life, the ultimate definition of my success was winning a job in a major symphony orchestra. I have had many peaks and valleys throughout my voyage and after a while the audition circuit can become tedious, often times breaking ones confidence in their abilities. After strings of advancing and walking at auditions, I was at a point where I was letting the result of an audition determine my worth as a musician. In the midst of self-turmoil, I honestly felt that I wasn’t successful because I had yet to win a job in an orchestra. It is at this point in my life that I had to ask myself, what is my definition of success? I’ve come to the conclusion that success in any category of life is defined by the individual. In order for you to figure this out, one has to ask a course of difficult questions. For example, what are my motives for pursuing this field? What do I really want to do with my life? How long do I want to take to achieve this goal? What are the steps to achieving said success? How much will I have to sacrifice to succeed? Is this what I want out of my life? After a point of self-evaluation, I came to the conclusion that I was indeed successful and that my pursuit of the “orchestral dream job” was actually more about my ego than my genuine love for orchestral music. At this same time I realized that I was extremely fortunate and blessed to have done so much in my career and that there were people who hadn’t accomplished nearly as much as me. I have friends and colleagues that feel that their definition of success is winning an orchestral job. I have a friend who is a college professor at a big named school. I also have colleagues that are happy teaching Jr. High or High School Band even though they would be a tremendous player. These band directors give 100% to the craft and they are extremely successful at what they do and are ultimately happy with their lives. One of my best friends defines his success by his marketing and podcast savvy to ultimately make a living in music and to start an online music school. Another friend is a fabulous flutist and she uses her music degree to teach general music and private lessons to travel the world during the summers. There is no right or wrong answer to your definition of success, as long as you as an individual are at peace with your decision. Just know that there are various career paths within music where you can be successful. the things that I have done. In my short career, I have had a great performance experience, studied with amazing teachers, and have been a few places. If I wanted to expand from what I had already done, I realized that I had to get my “paperwork” together. So I started by making my Curriculum Vitae, Teaching Philosophy, and Cover letter; explaining how to formulate those documents is a different article in itself. I then applied for a couple of teaching positions and was surprisingly called back for 2 of the 3 jobs. These callbacks (success) taught me that, In the process of diversifying my career, I could do many things that I always wanted to do, for example, record CD’s, tour, perform recitals and teach. I realized that I still can perform and give back at the same time. To me, this is the ultimate definition of success. I’m not saying that I will never take another orchestral audition, but I’ve eliminated the extraneous stress in my life by embracing the many different successes that I have had while continuing to try to improve as a musician, trombonist and now educator. With this mindset, I know I will be happy and successful teaching and sharing music with others. My only advice to you is to define what you feel success is, connect the dots of what you need to do in order to achieve said success, and be fearless in your pursuit of it. I was in a masterclass held by John Clayton (Jazz Bassist) while a member of the Disney Band in California in 2002 and he shared the most poetic but simple quote, “If you want to be successful in music, don’t quit!” John then proceeded to explain various degrees of success within music. If your ultimate success is to become an owner of a music store, a private lesson instructor, jazz mogul, or an orchestral player you can be successful in this if you just don’t quit. The practice of doubling has been a long-established one, but it is often shrouded in mystery when it comes to equipment and concept. For this blog, I’m focusing on tenor players who double on bass trombone, as this is of great interest to me. I also believe this is becoming a more popular practice, and evening tripling when you factor in the alto! Bass trombonists: don’t get your dander up – no one is gunning for your gigs or playing a 0G mouthpiece! 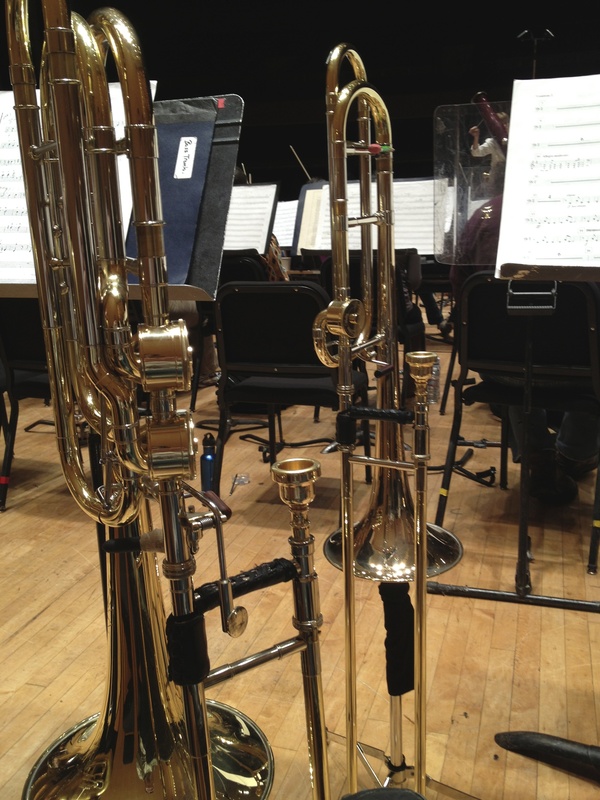 In an attempt to demystify doubling, I have reached out to several of my orchestral friends and colleagues for their thoughts on concept and equipment – mainly mouthpieces – when it comes to tenor players doubling on bass trombone. As you’ll see, there is a wide variety of ideas. While I focused on full-time orchestral players for this blog, it should be recognized that other stellar examples of doublers live and thrive in the studios of LA, show pits of NYC, university studios, and other locales. I had to draw up parameters somehow for this survey, and ultimately decided to keep it to players in the orchestral spectrum. This is not a slight towards those many other players who do this on a regular basis – in many cases more regularly than those I surveyed. Perhaps that is a topic for an extended post in the future…. Some of the contributors below have Bass Trombone responsibilities labeled as part of their contracts, others simply enjoy the opportunity when it arises. The employment of the doubler is quite different in the USA than it is in Europe, where the title of “Wechselposaune” is the technical term for the trombonist responsible for covering tenor and bass trombones. While it is a concept that has not quite caught on in the USA, some of the folks below are essentially “Wechsels”. The position in European orchestras is often much more demanding and I’m hoping to elaborate on this concept in another post. My sincere thanks again to my guest contributors! I generally use mid size bass trombone MP’s when I go back and forth between tenor and bass. I primarily play tenor in my job as Principal in TSO but do a lot of free lance work on bass. Generally, I have been using a Lasky 85 MD on bass which is like a 1.1/4 size cup, but has a deeper richer sound and sometimes I use a Hammond 20BXL, again like a 1 and 1/4 but a bigger bowl for a slightly richer sound. If I stay on bass for any extended period of time, I shift to a bigger bass size like a 21bxl. Like when I play at the Britt Festival in the summer. Bass is my position there. For most things though i find I can get away with the Hammond 20bxl or Lasky 85MD. I also think that the “bass trombone sound” concept can be achieved through concept and being able to control and get focus is more important than just trying to us big equipment. I have always doubled (trebled?) on alto, tenor and bass trombone. I played (and won a national audition) for the Eastern Music Festival in the 1990’s. I have even subbed on bass with the Philadelphia Orchestra. I encourage doubling in my teaching studio at the UNC School of the Arts, in Winston-Salem. I believe that playing a secondary and tertiary instrument is beneficial as long as your primary instrument does not suffer. For bass trombone I use a Griego 1.25 now. For years I played the Yamaha Doug Yeo but find the Griego more efficient now that I am getting older. Using a bass trombone mouthpiece on a tenor trombone makes it flat and dull sounding. On my orchestral tenor (Greenhoe Bach 42) I use 2 mouthpieces, a Griego/Alessi 5F and a Griego 3 depending on repertoire. I also use a Bach 36 regularly for pops concerts. Using a big mouthpiece like the Griego 3 with a small shank defeats the purpose of a brighter sound of the Bach 36, so there I use a Hammond 11. Zippy! On alto, I use a custom Greg Black with a 5 rim and the cup of a Shilke 51B mouthpiece. Not really, it all comes down to how you warm up. In general, I think it best to warm up on your primary instrument fully and then work on the other instrument. I encourage students to spend most of their time on the secondary instrument playing scales and basic routines, not excerpts. Pitch/lip bending exercise with the mouthpiece alone and on the instrument help center the embouchure and the sound. Flexibility before long tones. One of the reasons I have always been able to switch horns easily is that I play the entire range of the instrument on all my horns. F pedals to high F. Switching mouthpieces is like choosing a different color to paint with but it is all the same sound canvas. My approach to bass trombone is that it should simply be an extension from the tenor trombones, and that a larger instrument will inherently add fuller timbre to the blend. I choose a Greg Black 2G as my primary mouthpiece. It has ample richness, nice vibrancy, and a quick response. For the occasions where the repertoire is more substantial, I will use a Schilke 59. It is a large mouthpiece, but keeps the sound focused. I generally have no issue switching between mouthpiece makers and rim shapes. If I focus on achieving good sound and airflow, the idiosyncrasies between mouthpieces are less of a concern. I have always favored smaller mouthpieces: for a long time I used a Bach 5G and a Bach 1.5G. After a long period of testing, I have settled on the Hammond mouthpieces listed above. I find the “Tahu” to be large enough to allow me to perform all of the lower tenor trombone parts in the orchestra, including 3rd in a four person section, but it is also efficient enough to sit on top when playing principal. On the bass trombone, my choice to use the 20BL came similarly. I tried to stick with 1.5-sized mouthpieces as they work well as a light bass trombone mouthpiece in my tenor with a 50LT slide, but the sound was inappropriate for regular bass trombone playing. As a result, I moved to more of a 1.25-sized mouthpiece in order to get a fuller, more appropriate sound without feeling like I was swimming in the mouthpiece. I choose Karl Hammond’s mouthpieces as I find that they give core to my sound, but I am still able to change my sound, brighter or darker etc, to match the context in which I find myself. I find I need more time to adjust back and forth, but that particular trade off is worth it to realize my musical and professional goals on both instruments. I have chosen a true bass trombone mouthpiece in an attempt to make as legitimate a “bass trombone” sound as possible. The Hammond 20BL is comparable to a Bach 1.25G, with what I feel is a bit more space, as well as more point and center to the sound. The one downside is that I must spend more time on the bass in order to feel comfortable, but the upside (in my opinion) is a truer sound. While it takes more time to adjust when going back and forth between horns, keeping the mouthpieces unrelated — in size and feel — helps me establish a separate concept for each trombone. I apply this to the alto trombone, as well. The trick is to play at least a bit of bass every day, as refreshing the concept on a regular basis allows me to switch over to it more easily. I will vary my warm-up on a daily basis, often starting on the bass trombone rather than tenor. This is contrary to the advice offered by many of my colleagues, who support starting on your primary horn every day. I find that this maximizes my air support, and more importantly, keeps me mentally engaged, as the different physical stimulus aids in keeping me focused. I agree with Mr. Ilika that the bulk of time on your secondary should be scales and etudes, not excerpts. Before I was Solo Posaune with the Bruckner Orchester, I spent a lot of time playing Bass Trombone in College and then professionally as 2nd/Bass Trombone with the “Orchestre Philharmonique du Luxembourg”, and subbing with the NDR Radiophilharmonie in Hanover, Germany. While I was in Luxembourg, I also played bass trombone in a Trombone Quartet with two University Trombone Professors and a colleague from the OPL. So I was playing a good bit of bass trombone during that season going back and forth quite often. When I first started doubling on bass trombone in High school, I played on a Bach 2G. I tried larger ones, but I found the quality of sound throughout the register to be not very good. I simply wasn’t used to the big switch. I find that when starting out, making either no change, or a slight one to be a better way to start out. The most important thing is to keep the quality of sound and not allow the sound to become unfocused. I found myself trying the open the sound too much when playing bass trombone in a effort to fill out the horn. While you will need to use a lot more air for bass trombone, don’t allow the aperture to come too big. When using too big of a mouthpiece (then you’re normally used to) this is a common pitfall. I found simple mouthpiece buzzing exercises when warming up to help with this. Make sure the mouthpiece buzzing sound quality is more buzzy then airy. This should properly limit the size of aperture. When choosing your doubling mouthpiece, don’t go too wild in size. As a doubler, you want to always keep your quality of sound and not try to compete (size wise) with a devoted bass trombonist. If you are interested in going full time to bass trombone, then go nuts! But if your home base is going to be tenor trombone, then you don’t want to sacrifice your tenor playing too much. If you sound better playing on the same size mouthpiece as your tenor trombone, I would recommend that at first. Making the best quality of sound throughout the bass trombone register is always number one. After you’re comfortable with that, if you want to try to go a little bigger, then do so, but if you sacrifice the sound, there is no shame playing on your tenor trombone mouthpiece. I have to confess that I don’t totally remember what I played [before moving to Bass Trombone full-time]. I’m thinking that when I played tenor I used a Bach 3G for bass, but it might have been a 1.5G. When I won the job on bass it was on a GW Harwood mouthpiece–deep cup, wider rim with a sharp first angle. Lately I’ve gone back to a brass mouthpiece made by Griego. I feel it better to use a Bass mouthpiece even if it is in the entry level size. I have ventured into tuba territory once before playing in marching band through high school, and even a little at Indiana University. Maybe this helped me feel more comfortable on bass trombone equipment, or by having bass trombonists as formative teachers. For Bass Trombone, I choose a Greigo 2 which falls closer in diameter to a Bach 1.25. I play the Gregblack New York 3 series on tenor. Depending on the rep I play the different cups sizes. I have been playing bass in the orchestra for 4 years now, but I have liked the Giddings and Webster models, Adriano and Mark 1. They are a true bass mouthpiece but they have the thicker rim that I am used to on the tenor. I tried the Jim Markey model for a long time but it’s just toooo big. But I do agree one needs to be able to use a bass mouthpiece to at least get as close to the right sound that you can.